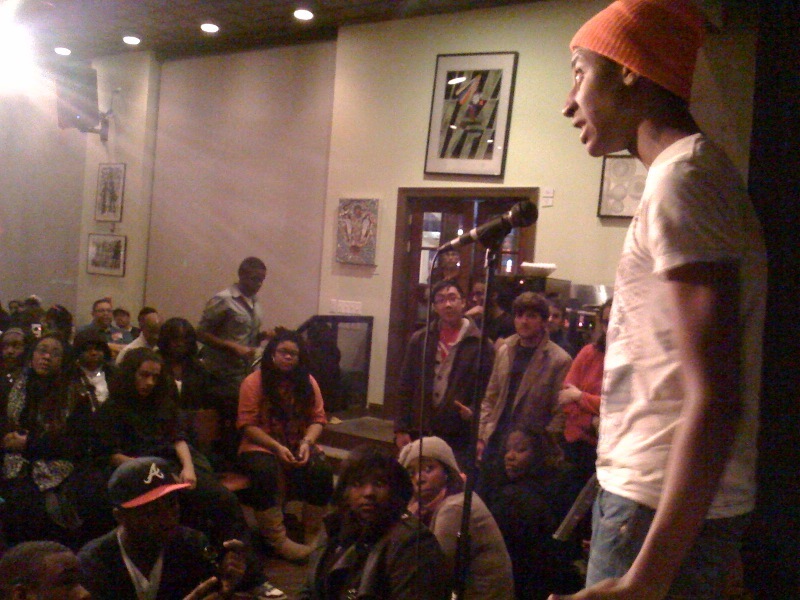 the busboys and poets youth open mic was fully packed tonight, as you can see here. in the lower left-hand corner you can see co-host JayTee next to friend & organizer/producer Miles, and in the first row sitting, with a red/orange top, you can see the other co-host, Diamante, from the DC Youth Slam Team. i forget the dude’s name who is performing in the photo, but i think it is Kosi. i will find out soon to make sure. he was one of the best young poets of the night, but they were all fabulous. we got youngins like 10 and 13 years old rapping, we got high schoolers playing guitars and singing songs, we got organizations like Teens Against the Spread of AIDS, City at Peace DC, The Purpose Writers, Words Beats Life, Inc., The DC Youth Slam Team, Cloud IX Productions, and of course, Busboys and Poets. we will have some video footage up soon to show you what it’s all about. for now, this super iphone pic will have to suffice. support your local young dreamers.